As far as single room renovations go, kitchen remodels are usually up there as one of the most expensive rooms of the home to renovate. Kitchens make up a sizable portion of the footprint of your main floor, they have the added expense of cabinetry, and they also generally have larger requirements for electrical and plumbing than other rooms in the home. In addition, most homeowners want to see a little bit better quality materials in the kitchen and are willing to spend money on upgrades such as hard surface counter tops or high quality flooring. So, what does it cost to renovate a kitchen? It can be hard to pinpoint even a ballpark figure because there are too many variables to even begin to narrow down some numbers, and even if ballpark figures can be established, that range of numbers is often large enough to make them next to useless. It would be like going to a car dealership and asking how much it costs to buy a car. With all the makes, models, options and aftermarket products available, there is too big of a spread to have any meaning. This doesn’t mean that there isn’t any rough information on what it costs to renovate a kitchen. Remodelling magazine has an article which includes information on the average costs of renovating different areas of your home for 2014. Although the information provided is for the US marketplace, one could argue that it closely mirrors the Canadian market. For 2014, the average cost of a minor kitchen remodel is $18 856. A major kitchen remodel sits at around $54 909. Keep in mind that these are averages, so, of course, costs could be higher or lower. This, then, begs the question what exactly is a minor kitchen remodel versus what is a major kitchen remodel? Luckily for us, you can further drill down and see an example of what changes are made for a major kitchen remodel and a minor one. Suffice to say, if you’re replacing everything, you’re going to be a lot closer to the $54 909 that the $18 856. 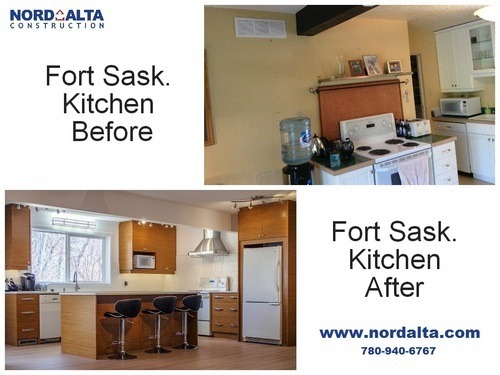 Remember too, that if you looking to change the layout of your kitchen or open up walls to create that ‘open concept’ that is the current trend, then you may be looking at additional costs. Changing structural elements often means that your kitchen renovation starts to affect other areas of the home. You can’t remove a wall and expect to only change the flooring or paint in just the kitchen area. The other room adjacent to the wall being removed has to be renovated as well. Kitchen renovations are expensive, but remember that you should always be shopping for value, not cost. As the old saying goes, “If you think it’s expensive to hire a professional, wait until you hire an amateur.” Make sure you are getting the best value, both in materials and in a contractor, that your money can buy.